The Bandstand is now available as a venue for weddings and ceremonies. Why not mark your special occasion by tying the knot at this unique location? The ornate architecture is magnificently detailed offering the perfect choice for couples wanting an elegant beach side experience. In addition to booking the Bandstand, Brighton's Registrar Office must be contacted to obtain a licence and book a registrar. 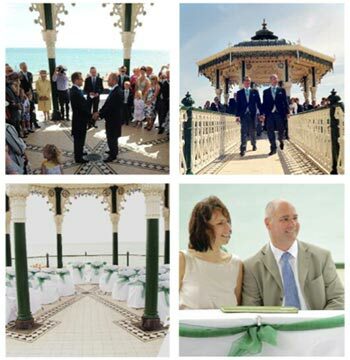 Between April and September the Bandstand is available to hire for weddings and ceremonies. It is available from Wednesday through to Saturday, from 11am to 1pm and from 2pm to 4pm (these times will be changing for 2019). Please note that the Bandstand itself can only be hired for ceremonies and not private functions of any other type due to its location. The Bandstand has a capacity of 50 people seated, with an additional 30 people standing. Please note that in adverse weather conditions the wedding or ceremony will be relocated to the Bandstand Café where the capacity is a maximum of 50 people only. It costs £665 to hire the Bandstand. It's an extra £245 to hire an additional ground level winged area, providing an additional capacity of 50 people. To discuss availability and your plans, and to ask any further questions, please contact our Events Office on (01273) 292712. The Bandstand hosts a variety of bands during the summer months, every Sunday throughout June, July and August. The usual hours of these performances are 2pm until 4pm, dependent on weather conditions. Any bands interested in performing should contact our Events Office on (01273) 292712. The Bandstand Café is situated beneath the Bandstand at beach level. The café offers a comprehensive service for ceremonies. Whatever your theme or budget, the team can assist with dressing the venue, flowers, menus, or a simple drinks reception. It can also be hired privately for other functions. Designed by Phillip Lockwood, Brighton Borough Surveyor, and completed in 1884 The Bandstand is considered to be one of the finest examples of a Victorian bandstand still surviving in England today. The original design featured a bridge linking the upper promenade with the Bandstand which was removed in the late 1970s. The ground floor was used as public conveniences until 2003 when vandalism forced their closure.